One of the finest ice skating facilities in the Midwest, the Centerpoint Community Ice offers a wide variety of programs including public skating, learn-to-skate classes, figure skating, youth hockey, adult hockey, special events, birthday parties and private rentals. The facility also hosts a full-service concession stand, skate sharpening services and a Pro Skate Shop for all your skating equipment, gear and apparel needs. We have GIFT CARDS! Stop by the Community Rink to purchase your gift card in any denomination. Public skating sessions are open to skaters of all ages and skill levels. We offer daytime and well as evening and weekend open skate sessions. Skate Rentals are available for all ages. Please call the Community Rink at 816-442-6128 or visit our public skate page for times and pricing. Classes Group lessons are available for all ages and abilities- no experience required! 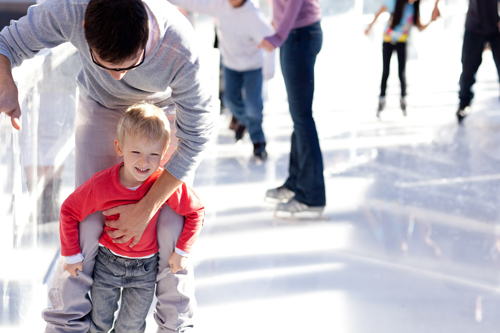 The Centerpoint Community Ice offers both weekday and weekend group lesson times. Lessons are scheduled around public skate times so that participants can stay and practice their skills. Classes include skate rental on the day of class and well as unlimited public session admissions for the skaters enrolled in classes! Contact the Skating Director,Tatum Neustadt at 816-442-6129 or visit our learn to skate page for class times, prices, and helpful information for skaters and parents! The Centerpoint Community Ice offers various hockey programs for kids and adults as well as Open Hockey and Stick & Puck Sessions. Open hockey times are designed for pick up games for players of all abilities. Stick & Puck sessions are designed for players to come out and work on their individual skills. Contact Brandon Schultz at 816-442-6124 or check our ice hockey page for times, age restrictions and more information. We also offer 5 different skill levels of Adult Hockey Leagues ranging from recreational to competative. Freestyle sessions and Private lessons are available for beginning to competitive skaters. Freestyle is a time for figure skating practice. Contact the Learn to Skate Director,Tatum Neustadt at 816-442-6129 or visit our figure skating page for more information. Need a fun activity for your group? The Centerpoint Community Ice is the perfect place to bring your church, school or office group. Check out our group events page for times to bring your group as well as our group rates. Call us at 816-442-6126 to make a reservation- no deposit required. Escape the ordinary and book your group to come out and play broomball. Broomball is a fun way to get everyone involved. Played in your street shoes on the ice, participants will enjoy trying to score on the opposing team. Call for more details or to book your group and get the fun rolling. Equipment is provided with your ice rental. Interested in a private ice rental for your group? Call us for available times and pricing.